Kroeber Anthropological Society Papers, no. 55-56, 1979, pp. 159-164. George Foster stands as a challenge to those anthropologists who believe that specialization is incompatible with breadth of view, that scientific and applied work cannot productively be part of one career, that historical and long time association with the same community and region tends to narrow comparative insight. For over forty years Foster has been writing and working in anthropology, and during those decades he has pursued his curiosity into a broad range of topics. In this paper, we recall the major contributions of an anthropologist who during a long career has never stopped asking interesting questions and has always followed leads that stimulated new insight. He has specialized, he has generalized, he has applied-all in the pursuit of deepening our understanding of human behavior. We begin with this topic because Foster's personal intellectual history is a remarkable instance of the ability, all too rare among senior scholars, to strike out boldly in new directions. Foster was trained, at Northwestern and at Berkeley, in the American historical school of Anthropology. The emphasis of that school, emanating from Boas and his students, such as Kroeber, Lowie, and others, was on meticulous ethnography and historical reconstruction . Like all his colleagues in that generation, Foster began his work along those lines. His early efforts in ethnography, based on field work in California ( 1939 ; 1944a ) and Veracruz (1940; 1942a; 1943a;1945a), still stand as basic sources. His historical interpretations relating to the precise origins of the earliest Iberian immigrants (1951a; 1952a) and the effect of European culture patterns on those of Latin America (1953a;1954a; 1960a) were abundantly documented, yet innovative, and stand as classic pieces in ethnohistory and comparative historical reconstruction (also see 1969c). Foster did not rest with his achievements in historical reconstruction. An early interest in kinship and role behavior (1949a) had developed by the 1960s into a major re-examination of what social anthropology was all about and into an analysis of bilateral social organization, peasant society, and the interrelationships of social structure, economics, psychology, and symbolic systems. All of this involved a major re-orientation and personal synthesis of disparate concepts, but it did not result in the abandonment of early interests, rather in their enrichment. He continues to publish detailed papers on ethnographic subjects (1975b), and although his attention to explicit historical analysis has waned in recent years, other early interests in economics, in the technical aspects of pottery making, and in applied anthropology and public health have continued to flourish. No one in the history of American ethnography has met the challenge of re-tooling in as effective, courageous, and productive a manner as has Foster. Not only his work, but the man, stand as exemplars. Although Foster's research interests have shifted over time, seven major themes of his work were already in evidence by about 1950: ethnography and field method; historical reconstruction; peasant economics; pottery and other aspects of technology; applied anthropology and development; medicine and public health; role analysis, social structure and symbolic systems. Foster's concern with ethnographic methodology (see 1951e; 1953d; 1956a; 1961b; 1968b; 1970f; 1974a; 1974d; 1976c; 1979a; 1979b) has been a constant feature of his intellectual development. His emphasis on precise and meticulous recording and reporting of field materials, combined with careful analysis of comparative data, is in the tradition of the natural sciences. Reference has already been made to his early work in California and Veracruz. The Mexican focus was renewed on the basis of field work begun in late 1944 (1948a). With its extensions, this research forms the empirical base for a great deal of Foster's later publications. First, it provided a foil for his reconnaissance of Spain (see below) and thus represented part of the foundation for his major interpretive summary of the effect of Iberian on Latin American culture (1960a). Second, the 1944-1946 field trip to Tzintzuntzan was but the earliest in a series spanning the past 35 years. 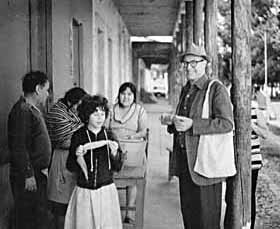 The results of this unparalleled set of observations on a single community were published in 1967 (1967a); since that time Foster has continued to return to Tzintzuntzan and this experience provides the basis for the forthcoming second edition of Tzintzuntzan: Mexican Peasants in a Changing World (1979c). It is not possible to overemphasize the importance of this recording over time, which is perhaps more in the tradition of astronomy than of social science. Few anthropologists, to our knowledge, have assembled an equivalent record of first-hand and archival data for the investigation of culture change. Indeed, he played a major role-with Elizabeth Colson and Thayer Scudder-in bringing together scholars with similar long-term field research experiences to discuss the value of this strategy at a 1975 Burg Wartenstein conference (1976h). The results of this conference have recently appeared in the book Long-Term Field Research in Social Anthropology (1979a). A careful reading of Foster's published work spanning the past 35 years discloses the detail of his broad scope. He has moved from fish nets, pottery and economics to the skein of social interaction, the native's perception of the social world, and his symbolic expression of it. He has long understood what many anthropologists today might learn-that the domain of anthropology is as wide as the activities of human beings, and that this domain need not be confined to the primitive, the isolated, the exotic. treatment of the history and culture of Tzintzuntzan (1948a). By the early 1950s, this interest had become comparative, with one of the first thorough reconnaissances of a European area by an American anthropologist (1951a) . This field survey of Spanish peasant culture resulted in an important ethnohistorical essay on the places of origin of Spanish niigrants to the New World (1 952a), a comparison of Iberian and Latin American medical beliefs (1953b), and a preliminary statement on the anthropological aspects of imperial conquest (1954a). A major work, Culture and Conquest (1960a), followed, detailing the historical relationships between the parent Iberian and the filial American cultures, and their confluences, segment by segment. Foster's ideas regarding the crystallization of a "conquest culture" are of great theoretical importance, applicable far beyond the immediately contributing corpus of American materials. They have special relevance to the impact of U.S. culture on many underdeveloped nations around the world, particularly in areas of American military and touristic presence. Foster has made many significant contributions to the study of peasant societies, beginning with his classic paper on "folk culture" (1953c). In particular, his ideas about the "dyadic contract" (1961a; 1963) and "the image of limited good" (1965a; 1972b) have been found to have wide relevance in understanding more generally how people behave under conditions of scarcity. Again, however, as an explicit subject for empirical investigation, this interest was evident in several early works (1942a; 1942b; 1944b; 1948a ; 1948b; etc). Which provided Foster with a solid foundation for the development of his theoretical orientations focusing on scarcity, as well as his interests in economic development and applied cultural change. Foster's concept of "limited good" continues to inspire a great deal of research and growing interest-as reflected in the articles by Zarrugh, Wagner, and Gamst in this volume-especially as we in the United States begin to experience scarcity in the areas of natural and human resources. Like his interest in economics, this is related to Foster's concern with development and to his later theories regarding the cultural consequences of a finite resource base. It resulted, however, in a kind of sub-field of its own-examination of pottery techniques and analysis of the social structure of potters around the world. His early descriptions of Mexican potters (1948a; 1948d; 1955a) were followed by others from places as distant as Bengal (1956c) and the Philippines (1956d), and his early historical interests crop up in his discussion of the relationship between mold- and wheel-made pottery (1959a; 1959b), and again in two important contributions of ethnography to archaeology (1960c; 1960d). A new turn in his interests, toward social structure and away from history, emerged in two later papers on the sociology of pottery (1965d) and on the role of contemporary pottery and basketry in Middle America (1967e). Much of Foster's interest in this field stems from his early association with the Institute of Social Anthropology at the Smithsonian in Washington, D.C. (1946d; 1947a; 1948h; 1950b; 1951d; 1967f; 1979d) and from his concentration on problems of acculturation in Latin America. His concerns were theoretical, practical, and broadly comparative. in 1948, Foster wrote a paper (1948i) on intercultural communication by professional experts-a subject now commonplace but scarcely perceived thirty years ago. In the early 1950s, he demonstrated the common problems in community development, irrespective of area, by use of the comparative method (19 5 1 c; 1955c; 1955e). Foster's most widely read work on the subject of economic development- Traditional Cultures and the Impact of Technological Change (1962a; revised edition, 1973a) -was for many years the "Bible" of applied anthropology. This book, which has been translated into Spanish (1964d), Portuguese (1964e), and Dutch (1966f), is without doubt the most widely read and influential book on applied anthropology, both among anthropologists and non-anthropologists. A more recent work, Applied Anthropology (1969a), is more theoretical and broader in its application; it should be required reading for all scientists interested in shortterm or long-range action programs. Through these and other publications (1956b; 1960e; 1961c; 1964c; 1968c; 1970b; 1974d) , Foster has done much to develop the field of applied anthropology and to keep pace with the important social problems of his time. In some ways, it is difficult to separate Foster's interest in public health from that in applied anthropology. However, his specific contributions have had their effect not only in the area of applying of social science knowledge to practical problems, but also in the realm of culture history. His earliest works, in accord with his historical concerns, were retrospective; they dealt with the notion of soul-loss (1944c; 1951b) and the application of Hippocratic humoral theories in Latin American folk medicine (1951c; 1953b). In the 1950s and the 1960s, Foster focused on applying anthropological insight to public health problems (1952c; 1952d; 1952f; 1953d; 1954b; 1958a; 1961b; 1966a; 1966b; 1968a) and his message carried far beyond anthropologists and the United States. In the 1970s, Foster has continued to urge the application of anthropological theory to the practical solution of medical problems (1974c; 1975c; 1976b; 1978c), but his most significant contribution has been to write-with Barbara Gallatin Anderson-the first comprehensive text on the biocultural and sociocultural phenomena in medical anthropology (1978a). This global overview of the field is balanced by his perpetual focus on Latin American folk medicine, exemplified by his dissection of "Hippocrates' Latin American Legacy" as the 1977 Bernard Moses Memorial Lecture at the University of California, Berkeley (1978b; 1978d). In conjunction with his recent paper on "Disease etiologies in non-western medical systems" (1976a), Foster shows an increasing interest in the logic of medical systems, a subject only now beginning to receive appropriate attention from anthropologists. We will concentrate most of our comments on Foster's intellectual development here because it is in this area that he has shown his major intellectual growth and has made his most lasting theoretical contributions. We must re-emphasize the magnitude of the shift in Foster's orientation, stepping as it did across the major cleavages in contemporary cultural anthropology-between historicism and structuralism, between empiricism and theory, and in many ways from the heritage of the nineteenth century to the promise of the twentieth. The importance of this shift by an anthropologist can be illustrated with a whimsical analogy: it is rather like Newton, after sinking a series of neat three-cushion shots in the side pocket, putting up his cue to work out the psi-function with his chalk. Foster's major theoretical problem from the early 1950s onward has been the nature of peasant society as held by the natives, and their symbolic expressions of that view. Many of his ideas are crystallized in Peasant Society: A Reader (1967b), which he co-edited with two colleagues at BerkeleyJack M. Potter and May N. Diaz-and which contained a number of Foster's pieces, including an original essay defining "what is a peasant" (1967c). Apart from earlier sections in monographs, Foster's first paper on the subject of peasant society was the one on voluntary organizations (1953a), coming directly out of his Ibero-American comparative interests. Although it was largely historical and comparative, it was important in demonstrating the wide range of fraternal organizations as cohesive units above the level of the household in peasant society. Most anthropological analysis of higher-level units had been based on lineal kinship; relatively little attention had been paid to voluntary organizations. Foster's basic problem was the identification of structural units and/or principles lying above the family or household but below the lowest-level political or territorial unit. His solution lay not in the identification of units per se (other than some voluntary organizations) but rather in the identification of structural principles and symbolic devices. Two papers on the dyadic contract (1961a; 1963) mark the real shift in his thinking and are among the most widely cited papers in contemporary peasant studies. In them, Foster explores the tenuous but sufficient linkages established by overlapping pairs of persons in a system of minimal organic solidarity. The theoretical assumptions underlying this model involve a finite base of resources, the natives' perception of that limitation, and the natives' corollary desire to limit and solidify social linkages. Foster's earlier interests in economics (1942a; 1948b) and in community development (particularly 1961c; 1962a) blend here into a higher level theory from which much of the "dyadic contract" model can be seen to now A paper (1964a) closely related to those of the dyadic contract (1961a; 1963), peasant interpersonal relations (1960-1961), and peasant social networks (1969d) dealt with the function of speech forms in symbolizing social distance. Apart from its relationship to Foster's developing theory and its earlier roots in his linguistic descriptions (1948k), this paper is an early and independent analysis in socio-linguistics. (Foster continues his pursuit of linguistic dimensions with a recently completed, and still unpublished, paper entitled "Responsibility for Illness in Tzintzuntzan: A Cognitive-Linguistic Anomaly"). In the same year that he dealt with the symbolism of speech forms, Foster examined the economic implications of "treasure tales" (1964b) for peasant populations with finite resource bases-namely, that since available goods were limited, no one could become wealthy without robbing another or discovering treasure. In the next year, Foster issued his provocative statement on the "image of limited good" (1965a). He followed this "classic" paper (reflected in its selection for reprinting in the recently issued Selected Papers from the American Anthropologist, 1946-19 70 [1976e] ), with a series of articles on peasant world view (1965c; 1966c; 1966h; 1967d; 1970a; 1972a; 1973b). His ideas on these topics have been hotly debated and widely cited, and remain among the most controversial in the anthropological study of peasant society. Although no commentators are neutral on the subject, it is curious that some accuse Foster of economic determinism while others charge him with cognitive determinism (see 1966e; 1970c; 1972b; 1974b; 1975a; and 1976d for his responses to the critics and commentators). For example, about half of the Fall 1968 issue of Human Organization, the journal of the Society for Applied Anthropology, was devoted to "Perspectives on the Atomistic-Type Society". Many of the articles explicitly confront-and most confirm- Foster's ideas about the structure of peasant life. In summarizing the thrust of the collected papers, Jerrold Levy concluded that "...Foster has emerged as the new senior theoretician requiring mention in all studies of peasantry" (1968:234). Perhaps the most telling criticism of Foster's theory of peasant society and economics has been that his theory is more widely applicable than he was at first willing to admit. As Gamst demonstrates for American railroad men in his article in this volume, "limited good" ideologies and behaviors are characteristic not only of peasant societies perpetually starved for resources, but also occur in more advanced societies when the economy ceases to expand. Over a wide range of cultures, the interpersonal behavior and symbolic expressions of people can be fairly well predicted from a knowledge of the state and rate of change in their economic systems. The model may be used to explain strong sanctions against upward mobility and peasant inertia as well as the creation and use of leveling mechanisms and the absence of cooperative behavior. The advantage of Foster's formulation in explaining reluctance to engage in community enterprises, over competing social scientific theories, or the once widespread colonial explanations of native stupidity, laziness, and the like, are now obvious. We stress again that the separate interests that have characterized Foster's work have in fact been interrelated strands crossing each other repeatedly, one notion fertilizing another, growth occuring both in breadth and sophistication. Foster has come to be regarded as a principal figure in peasant studies, applied anthropology, public health, and medical anthropology, as well as a major contributor to the field of folklore (1939; 1941b; 1945a; 1945b; 1948c; 1950a; 1952b; 1955b; 1964b; 1966c; 1970a). Whatever his theoretical focus, he is always recognized as a Mexicanist and Latin Americanist of the top rank. Pedagogy is, more than anything else, a matter of personality, and Foster's teaching-style is perfectly in character with his research and publications. His preparations for lectures are detailed and thorough, his delivery in lecture or seminar well organized, precise, and solid. His standards are high, but he is harder on himself than he is on the students. Its style in teaching is, one might say, old-fashioned: he does not cozy up to students. Learning from Foster is a no-nonsense proposition and seldom easy on the student's ego. He listens, although he does not always agree. It is noteworthy that he was the first social anthropologist in the Berkeley department to take students with him to the field, involving them directly in his own Mexican field work. He served as Acting Director of the Museum of Anthropology, and several times contributed as departmental chairman and graduate advisor. It was Foster who developed the system of phased steps in the graduate program, substituting meaningful scrutiny for formal hurdles. He was instrumental in winning financial support for graduate student fieldwork. Most recently, he has built and maintained the Medical Anthropology Program, carried on jointly by UC Berkeley and the UC Medical School in San Francisco. Students have benefited greatly from his organizational and entrepreneurial abilities. It was Foster who took the initiative in finding and keeping training grants that led to historically unheard of levels of financial support for students. No member of the Berkeley department has been more diligent in pursuit of its welfare. But his contributions went far beyond the Berkeley academic community. As a frequent consultant to governmental development and public health programs, and as a participant in many scientific conferences around the world, his contribution has been considerable. From 1944 to 1946, while carrying out his initial fieldwork in Tzintzuntzan, Foster taught at the National School of Anthropology and History in Mexico City. In the seven years following he was Director of the Institute of Social Anthropology at the Smithsonian In 1954 he went to Mexico as consultant on the "History of the Americas" project of the Commission on History of the Pan American Institute of Geography and History. In 1951, while Director of the ISA of the Smithsonian, Foster proposed to the Health Division of the Institute of Inter-American Affairs that he and his Latin American colleagues investigate the relationships between culture and public health innovations. This idea, novel at the time but now more universally accepted, was launched by a mimeographed paper, "A cross cultural analysis of a technical aid program" (1951c), subsequently translated into Spanish (1952g and 1967h) and summarized in Portuguese (1953h; 1955f; 1958b). On the basis of this preliminary effort, Foster participated in a six-month-long analysis (1953d and 1953e) of the first ten years of North American-Latin American bilateral technical aid programs in Latin America. Some have said that this demonstration following in the wake of the ISA work, launched applied anthropology in international work in its contemporary form (see Richard Adam's quote; in Foster 1979e:214). This is but an abbreviated mention of professional service, but we should mention Foster's role as President of the American Anthropological Association in the volatile period of the late 1960s. He was instrumental in reorganizing the A.A.A. 's administration to enable it to cope with a greatly increased membership, and he played an important role in the acquisition and organization of its new headquarters in Washington. All of these talents and experiences have enriched his intellectual development, just as one would expect from a scholar with a synthetic mind. George Foster's work over the past forty years-covering the fields of peasant economics, material culture, folklore, linguistics, symbolism, role analysis, community development, and public health-has been based on personal field work and consultancies in more than a dozen countries ranging from Afghanistan to Peru. As if his publication record of 21 books and monographs, more than 100 articles, and 45 book reviews were not sufficient, Foster has always been concerned that his works be translated and reprinted so as to be accessible to scholars outside of the United States and other English-speaking countries. The eagerness of anthropologists and publishers to have his works is reflected in the translation of more than 20 of his major books and articles into Spanish, Portuguese, and other languages, as well as in the reprinting in English of nearly 30 of his works. This continuing heavy demand for his ideas is also documented by Foster's entries in the Social Science Citation Index. In these days when the half-life of scholarly knowledge has diminished to only a few years, it is remarkable to see that some of his works published over twenty-five years ago are still consistently cited (personal communication from Ms. Dorothy Koenig, Librarian of the Anthropology Library at Berkeley). Perhaps even more impressive than the honored status of his individual works is the integrity of the full corpus of Foster's scientific, academic, pedagogical, and professional contributions. His career is surprisingly of a piece; nothing in this record is really isolated. For example, his work on pottery is a part of his interest in the economy, which blends with that on community development and public health, and his interest in community development (and his perception that peasants often lack such an interest) sparked investigations of role behavior, worldview, and culture change. All of his research experience, professional devotion, and productivity have been brought to his teaching and to his administrative responsibilities in the Department and University in which he has spent the last 25 years. His own intellectual development is an object lesson, and his influence on students in social science has been and continues to be immeasurable. Acknowledgement: The authors wish to thank Ms. Dorothy Koenig (Librarian of the Anthropology Library at Berkeley) and Ms. Gerry Moos (Secretary in the Anthropology Department at Berkeley, with special responsibility for the NIGMS Traineeship Program directed by George Foster) for their assistance in the preparation of this article. We also wish to thank Robert V. Kemper for providing a number of editorial suggestions which have been incorporated into the final version of this article. 1939 "War stories from two enemy tribes." Journal of American Folklore 52:141-154 (with Walter Goldschmidt and Frank Essene). 1940 Notes on the Popoluca of Veracruz. Mexico D. F.: Instituto Panamericano de Geografia e Historia, Publ. No. 5 1. 1941a "From a Mexican diary." International Quarterly, Winter pp. 33-36. 1941b "String figure divination." American Anthropologist 43:126-127. 1942a A primitive Mexican economy. Monographs of the American Ethnological Society, V. New York: J. J. Agustin. 1942b "Indigenous apiculture among the Popoluca of Veracruz." American Anthropologist 44:538-542. 1942c "Ordeal by vapor." Bulletin of the Pan American Union 76(8):443-446 (August). 1942d Review of Stig Ryden, A study of the Siriono Indians. In Boletin Bibliografico de Antropologia Americana 6:137-138. 1942e Review of Alfred Metraux, The native tribes of eastern Bolivia and western Matto Grosso. In Boletin Bibliografico de Antropologia Americana 6:138-139. 1943a "The geographical, linguistic, and cultural position of the Popoluca of Veracruz." American Anthropologist 45:531-546. 1943b Review of E. F. Castetter and W. H. Bell, Pima and Papago Indian Agriculture. In Pacific Historical Review 11:85-86 (March). 1944a A summary of Yuki culture. University of California Anthropological Records 5(3):155-244. Berkeley: University of California Press. 1944b "Primitive and machine-age productivity. The American Journal of Economics and Sociology 3:583-598. 1944c "Nagualism in Mexico and Guatemala." Acta Americana 2:85-103. 1945a Sierra Popoluca folklore and beliefs. University of California Publications in American Archaeology and Ethnology 42(2):177-250. Berkeley: University of California Press. 1945b "Some characteristics of Mexican Indian folklore." Journal of American Folklore 58:225-235. 1945c Review of Alexander and Dorothea Leighton, The Navajo door. In America Indigena 5:90-9 1. 1945d Review of Alfonso Villa R., The Maya of East Central Quintana Roo. In America Indigena 5:334-336. 1946a "Expedicion etnologica a la region del lago de Patzcuaro." Morelia, Michoacan: Anales del Museo Michoacano, Segunda Epoca Num. 4, pp. 65-67. 1946b Review of Ralph L. Beals, The contemporary culture of the Cahita Indians. In Journal of American Folklore 59:336-338. 1946c Review of Ralph L. Beals, Ethnology of the Western Mixe. In Boletin Bibliografico de Antropologia Americana 8:166-168. 1946d "The Institute of Social Anthropology." Boletin Bibliografico de Antropologia Americana 9:22-25. 1947a "The Institute of Social Anthropology." The Record (Scientific and Cultural Cooperation) 3(6):7-10 (June). Washington, D.C.: The Department of State. 1947b "The origin of maize." In Frances Toor, A treasury of Mexican folkways, pp. 502-507. New York: Crown Publishers. 1948a Empire's children: the people of Tzintzuntzan. Washington, D.C.: Smithsonian Institution, Institute of Social Anthropology Publ. No. 6. 1948b "The folk economy of Mexico with special reference to marketing." The Journal of Marketing 13(2):153-162 (October). 1948c "The current status of Mexican Indian folklore studies." Journal of American Folklore 61:368-382. 1948d "Some implications of modem Mexican mold-made pottery." Southwestern Journal of Anthropology 4:356-370. 1948e "Museos ethnograficos al aire libre para las Americas." America Indigena 8:89-94. 1948g "La base de la cultura modema de Tzintzuntzan, Mich." In El occidente de Mexico (V Mesa Redonda Compte Rendue), pp. 201-202. Also "Resumen linguistica y etnografia contemporanea p. 221. Mexico, D. F,: Sociedad Mexicana de Antropologia. 1948h "The Institute of Social Anthropology 1947-1948." Mexico, D. F.: Boletin Bibliografico de Antropologia Americana 11:104-107. 1948i "Cultural cautions for personnel going to Latin America." Washington, D.C.: Prepared for the Foreign Service Institute. 12p. (Mimeographed). 1948j Review of D. B. Stout, San Blas acculturation: an introduction. In Boletin Bibliografico de Antropolgia Americana 10:201-203. 1948k Sierra Popoluca speech. Washington, D.C.: Smithsonian Institution, Institute of Social Anthropology, Publ. No. 8. 1949a "Sierra Popoluca kinship terminology and its wider implications." Southwestern Journal of Anthropology 5:330-344. 1949c Review of Archives Ethnos (No. 1, Buenos Aires, 1948) and Revista do Museu Paulista (Nova Serie, Vol. 1, Sao Paulo, 1947). Journal of American Folklore 62:442-443. 1949 d Review of Ralph Linton, Most of the world. The peoples of Africa, Latin America, and the East today. In American Anthropologist 51:474-47 5. 1950a "Mexican and Central American Indian folklore." The Funk and Wagnalls Standard Dictionary of Folklore, Mythology and Legend 2:711-716. New York: Funk and Wagnalls Co.
1950b "La Smithsonian Institution y su. labor cientifica." Estudios Americanos 2(6):295-299 (Mayo). Sevilla, Spain. 1950c Review of Oliver LaFarge, Santa Eulalia The religion of a Chuchumatan Indian town. In Journal of American Folklore 63:485-486. 1951a "Report on an ethnological reconnaissance of Spain." American Anthropologist 53:311-325. 1951b "Some wider implications of soul-loss illness among the Sierra Popoluca." In Homenaje al Doctor Alfonso Caso, pp. 167-174. Mexico, D.F: Sociedad Mexicana de Antropologia. 1951d "The Institute of Social Anthropology, Washington, 1950." Boletin Bibliogrdfico de Antropologfa Americana 13(Part 1):74-76. 195le "Suggestions for field recording of information on the Hippocratic classification of diseases and remedies." Kroeber Anthropological Society Papers 5:1-5. Berkeley, California (with John H. Rowe). 1951g Review of Carlo Levi, Christ stopped at Eboli. In Boletin Bibliografico de Antropologia Americana 13(Part 2):45-47. 1952a "The significance to anthropological studies of the places of origin of Spanish emigrants to the New World." In Sol Tax (ed. ), Acculturation in the Americas, pp. 292-298. Proceedings and Selected Papers of the XXIX International Congress of Americanists. Chicago: University of Chicago Press. 1952b "The feixes of Ibiza." The Geographical Review 42:222-237. 1952c "Relationships between theoretical and applied anthropology: a public health program analysis." Human Organization 11(3):5-16. 1952d "Report of technical discussions on the methodology of health protection in local areas" (Rapporteur, Group 5), Fifth World Health Assembly. Chronicle of the World Health Organization 6(7-8):219-241 (August). Geneva, Switzerland. 1952f "Papel de la antropolo i en los programas de salud publica." Boletin de la Oficina Sanitaria Panamericana 33:345-347. 1952i Review of Oscar Lewis, Life in a Mexican village: Tepoztlan restudied. In American Anthropologist 54:239-240. 1952j Review of Sol Tax (ed. ), The civilizations of Ancient America: selected papers of the XXIX International Congress of Americanists In The Americas 9(2):256-258 (October). 1952k Review of John Gillin, The culture of security in San Carlos: a study of a Guatemalan community of Indians and Ladinos. In Boletin Bibliogrdfico de Antropologia Americana 14(Part 2):119-120. 19521 Review of Ruth Matilda Anderson, Spanish costume: Extremadura. In American Anthropologist 54:420. 1953a "Cofradia and compadrazgo in Spain and Spanish America." Southwestern Journal of Anthropology 9:1-28. 1953b "Relationships between Spanish and Spanish-American folk medicine." Journal of American Folklore 66:201-217. 1953c "What is folk culture?" American Anthropologist 55:159-173. 1953d "Use of anthropological methods and data in planning and operation" (10-year evaluation of the bilateral health programs, Institute of Inter-American Affairs). Public Health Reports 68(9):841-857 (September). 1953e "Cultural aspects." Chapter 2 in 10 years of cooperative health programs in Latin America, pp. 11-29. Washington, D.C: U. S. Public Health Service. 1953i Review of Gonzalo Aguirre Beltran, de la poblacion indigena de la cuenca del Tepalcatepec. In American Anthropologist 55:271-272. 1953j Review of Woodrow Borah, New Spain's century of depression. In American Anthropologist 55:128-129. 1953k Review of Wilson M. Hudson (ed. ), The healer of Los Olmos and other Mexican lore. In Midwest Folklore 3:120-122. 1954a "Aspectos antropologicos de la conquista espanola de America." Estudios Americanos, Revista de la Escuela de Estudios Hispano-Americanos, Sevilla, 8:155-171. 1954b "The human factor in public health programs." Bulletin of Sanitation, No. 2, April 1, pp. 1-4 (Mimeographed). "The Bulletin is issued by the Northern California Chapter of the California Association of Sanitarians, National Association of Sanitarians, Inc."
1954c Review article "The 'Programa de Historia de America," of the Pan American Institute of Geography and History." In Revista Interamericana de Bibliografia 4:301-304. 1954d Review of Fernando Camara Barbachano, Chacaltianguis: comunidad rural en la ribera del Papaloapan. In American Anthropologist 56:313-314. 1954e Review of Juan Comas, Bibliografia selectiva de las culturas indigenas de America. In America Indigena 14:93-95. 1954f Review of Pedro Carrasco, Tarascan folk religion: an analysis of economic, social, and religious interactions. In American Anthropologist 56:13 1. 1955a Contemporary pottery techniques in southern and central Mexico. New Orleans: Tulane University, Middle American Research Institute, Publ. 22:1-48. 1955b "The fire walkers of San Pedro Manrique, Soria, Spain." Journal of American Folklore 68:325-332. 1955c "Guide lines to community development programs." Public Health Reports 70(l):19-24 (January). 1955d "Salt production in the Balaerics" [Abstract of Juan Vila Valenti "Ibiza y Formentera, islas de la sal," Estudios Geograficos 14:363-408, 1953]. Geographical Review 45:117. 1955e Report on community development programs in India, Pakistan and the Philippines. Washington, D.C.:U.S. Dept. of State, International Cooperation Administration (with Harold S. Adams and Paul Taylor). 1955g Review of Alfonso Caso et al., Metodos y resultados de la polftica indigenista en Mexico. In America Indigena 15:234-236. 1955h Review of Lyle Saunders, Cultural difference and medical care. In Economic Development and Cultural Change 4:94-96. 1955i Review of Ignacio Bernal and Eusebios Davalos Hurtado (eds. ), Huastecos Tontonacos y sus vecinos. In Ciencias Sociales 6(32):104-106. 1955j Review of Elman R. and Helen S. Service, Tobati: Paraguayan town.. In American Anthropologist 57:635-636. 1955k Review of J. A. Pitt-Rivers, The people of the sierra. In American Anthropologist 57:642-643. 1955l Review of Gonzalo Aguirre Beltran, Formas de gobierno indigena. In Boletin Bibliogrdfico de Antropologia Americana 17(Partil): 137-138. 1956a "Working with people of different cultural backgrounds." California's Health 13(14):107-110 (January 15). 1956b "Applied anthropology and modem life." In Estudios antropologicos publicados en homenaje al doctor Manuel Gamio, pp.333-341. Mexico, D. F: Universidad Nacional Autonoma de Mexico, Sociedad Mexicana de Antropologia. 1956c "Pottery-making in Bengal." Southwestern Journal of Anthropology 12:395-405. 1956d "Resin-coated pottery in the Philippines." American Anthropologist 58:732-733. 1956e "Comentario" (on "Los Indios en la economia de Guatemala," by Sol Tax). In Integracion 'Social en Guatemala (Jorge Luis Arriola, ed. ), pp. 129-136. Guatemala City. 1957d Review of Roberto de la Cerda Silva, Los indigenas mexicanos de Tuxpan, Jal. In Hispanic American Historical Review 37:112. 1958a Problems in intercultural health programs. New York: Social Science Research Council, Pamphlet No. 12. 1958c Review of Ralph L. Beals and Norman D. Humphrey, No frontiers to learning. The Mexican student in the United States. In Science 127(3291):192. 1959a "The Coyotepec molde and some associated problems of the potter's wheel." Southwestern Journal of Anthropology 15:53-63. 1959b "The potter's wheel: an analysis of idea and artifact in invention." Southwestern Journal of Anthropology 15(2):99-119. 1959e Review of Raymond H. Thompson, Modern Yucatecan Maya pottery making. In American Antiquity 25:287. 1960a Culture and conquest: America's Spanish heritage. New York: Wenner-Gren Foundation for Anthropological Research, Viking Fund Publications in Anthropology No. 27. 1960b "Edward Winslow Gifford 1887-1959." American Anthropologist 62:327-329. 1960c "Life-expectancy of utilitarian pottery in Tzintzuntzan, Michoacan, Mexico." American Antiquity 25:606-609. 1960d "Archaeological implications of the modern pottery of Acatlan, Puebla, Mexico." American Antiquity 26:205-214. 1960e "Nationalism in Africa: an attempt at prediction." Kroeber Anthropological Society Papers 23:1-6. Berkeley, California. 1960f "Algunos procesos de los cambios socio-culturales." Boletin informativo Nos. 29-30:6-9 (AbrilSeptiembre). Patzcuaro, Mexico: Centro Regional de Educacion Fundamental para la America Latina (CREFAL). 1960h Review of Georgette Soustelle, Tequila: un village nahuatl du Mexique oriental. In The Hispanic American Historical Review (May), 40:324-325. 1960 "Interpersonal relations in peasant society," and "Rejoinder." Human Organization 19:174-178; 1961 183-184. 1961a "The dyadic contract: a mode for social structure of a Mexican peasant village." American Anthropologist 63:1173-1192. 1961b "Public health and behavioral science: the problems of teamwork." American Journal of Public Health and the Nation's Health 51:1286-1293. 1961c "Community development and the image of the static economy." Community Development Bulletin 12:124-128. 1962a Traditional cultures: and the impact of technological change. New York: Harper & Bros.
1963 "The dyadic contract, II: patron-client relationship." American Anthropologist 65:1280-1294. 1964a "Speech forms and perception of social distance in a Spanish-speaking Mexican village." Southwestern Journal of Anthropology 20:107-122. 1964b "Treasure tales, and the image of the static economy in a Mexican peasant community." Journal of American Folklore 77:39-44. 1964c "El desarrollo de la comunidad en pequenas poblaciones: un punto de vista antropologico." In Los aportes de la sociologia y de la antropologia para el desarrollo de la comunidad, pp. 41-53. Guatemala City: Publicaciones de la Secretaria de Bienestar Social del Gobierno de la. Republica de Guatemala, No. 5. 1964f Review of Bert F. Hoselitz and Wilbert E. Moore (eds. ), Industrialization and society. In American Anthropologist 66:667-669. 1965a "Peasant society and the image of limited good." American Anthropologist 67:293-315. 1965c "Cultural responses to expressions of envy in Tzintzuntzan." Southwestern Journal of Anthropology 21:24-35. 1965d "The sociology of pottery: questions and hypotheses arising from contemporary Mexican work." In F. R. Matson (ed. ), Ceramics and man. New York: Wenner-Gren Foundation for Anthropological Research, Viking Fund Publications in Anthropology No. 41:42-61. 1965e "The new National Museum of Anthropology in Mexico City." American Anthropologist 67:734-736. 1966c "Euphemisms and cultural sensitivity in Tzintzuntzan." Anthropological Quarterly 39:53-59. 1966d Contemporary Latin American Culture: an anthropological sourcebook. New York: Selected Academic Readings, Inc. (editor). 1966e "Foster's reply to Kaplan, Saler, and Bennett" [On "Image of limited good"] American Anthropologist 68:210-214. 1966h "World view in Tzintzuntzan: Reexamination of a concept." In Summa anthropologica en homenaje a Roberto J. Weitlaner. Mexico, D.F: Instituto Nacional de Antropologia e Historia. pp. 385-393. 1966i Review of Edward W. Gifford, The Coast Yuki. In American Anthropologist 68:783-784. 1966j Review of William McCord, The springtime of freedom: evolution of developing societies. In Man 1:262. 1967a Tzintzuntzan: Mexican peasants in a changing world. Boston: Little, Brown & Co. 372p. 1967c "Introduction: what is a peasant?" In Jack M. Potter; May N. Diaz; and George M. Foster (eds. ), Peasant society: a reader, pp. 2-14. Boston: Little, Brown & Co.
1967d "Introduction: peasant character and personality." in Jack M. Potter; May N. Diaz; and George M. Foster (eds. ), Peasant society: a reader, pp. 296-300. Boston: Little, Brown & Co.
1967e "Contemporary pottery and basketry." In Manning Nash (ed. ), Handbook of Middle American Indians, vol. 6, pp. 103-124. Austin: University of Texas Press. 1967f "The Institute of Social Anthropology of the Smithsonian Institution 1943-1952." Anuario Indigenista 27:173-192. Mexico: Institute, Indigenista Interamericano. 1967l Review of Arthur J. Rubel, Across the tracks: Mexican-Americans in a Texas city. In American Anthropologist 69:238. 1968a "Commentary" on "Illness and health services" (Chapter 11, Social science and health planning: culture, disease and health services in Colombia, R. F. Badgley, ed.). In The Milbank Memorial Fund Quarterly 46(2), Part 2:171-176. 1968b "The social anthropological field experience." Kroeber Anthropological Society Papers 39:1-19. 1968c "El cambio cultural planificado y la irrigacion en la Cuenca del Lago de Patzcuaro." Mexico, D.F. : Anuario Indigenista 28:45-5 1. 1968f Review of Michael Belshaw, A village economy: land and people of Huecorio. In Hispanic American Historical Review 48:714-715. 1969a Applied anthropology. Boston: Little, Brown & Co.
1969c "The Mixe, Zoque, and Popoluca." In Evon Vogt (ed. ), Handbook of Middle American Indians, Vol. 7, Pt. 1, pp. 448-477. Austin: University of Texas Press. 1969d "Godparents and social networks in Tzintzuntzan." Southwestern Journal of Anthropology 25:261-278. 1969e Review of Andre Corten and Andree Corten, Cambio social en Santo Domingo. In Man 4:674. 1970a "Character and personal relationships seen through proverbs in Tzintzuntzan, Mexico." Journal of American Folklore 83:304-317. 1970b "Anthropology and the problems of society." [unsigned]. In Allen H. Smith and John L. Fischer (eds. ), Anthropology, pp. 78-93. The Behavioral and Social Science Survey [BASS]. Englewood Cliffs, NJ: Prentice-Hall. 1970c "Comments on Gerrit Huizer, "'Resistance to change' and radical peasant mobilization: Foster and Erasmus reconsidered." Human Organization 29:313-314. 1970d "Robert J. Weitlaner 1883-1968." American Anthropologist 72:343-348. 1970e Review of June Nash, In the eyes of the ancestors. In The Hispanic American Historical Review 50:785-786. 1971a Letter to the Editor: "Anthropology on the warpath: an exchange." The New York Review April 8, pp. 43-44. 1971b "Comentario sobre 'Antropologia en pos de guerra... America Indigena 31:1049-1054. 1971c "Peasant society and the image of limited good." In Y. A. Cohen (ed. ), Man in adaptation: the institutional framework pp. 298-311. Chicago: Aldine. 1971d Review of Maurice Boyd, Tarascan myths and legends. In Hispanic American Historical Review 51:186-187. 1971e Review of Robert F. G. Spier, From the hand of man: primitive and preindustrial technologies. In Man 6:300-301. 197 1 f Review of Erich Fromm and Michael Maccoby, Social character in a Mexican village. In The American Journal of Sociology 77:336-338. 1972a "The anatomy of envy: a study in symbolic behavior," and "Reply" [to commentators]. Current Anthropology 13:165-186, 198-202. 1972b "A second look at limited good." Anthropological Quarterly 45:57-64. 1972c "Foreword" to David C. Korten, Planned change in traditional society: psychological problems of modernization in Ethiopia, pp. v-viii. New York: Praeger. 1972c "Peasant society and the image of limited good." In J. D. Jennings, and E. A. Hoebel, (eds. ), Readings in anthropology, pp. 324-334. New York: McGraw-Hill. 1973a Traditional societies and technological change. New York: Harper & Row. [2nd. ed. of Traditional Cultures, 1962]. 1973b "Dreams, character, and cognitive orientation in Tzintzuntzan." Ethos 1: 106-12 1. 1974a Anthropologists in cities. Boston: Little, Brown & Co. (with R. V. Kemper, co-editor). 1974b "Limited good or limited goods: observation of Acheson." American Anthropologist 76:53-57. 1974c "Medical anthropology: some contrasts with medical sociology." Medical Anthropology Newsletter 6(l):1-6. 1974d "Technical assistance methodology: an anthropologist's view." Development Digest [Prepared by the National Planning Association for A. 1. D.] 12(3):87-94. 1974e "Kalervo Overg 1901-1973." American Anthropologist 76:357-360 (with Marlin R. McComb). 1974f Antropologfa aplicada. Mexico: Fondo de Cultura Economica [Translation of Applied anthropology, 1969. 1975a "'Comments' on J. R. Gregory, 'Image of limited good, or expectation of reciprocity?... Current Anthropology 16:86-87. 1975b "Urbanization in Mexico: the view from Tzintzuntzan." Latin American urban research 5:53-75. Beverly Hills: SAGE Publications. (with R. V. Kemper). 1976a "Disease etiologies in non-western medical systems." American Anthropologist 78:773-782. 1976b "Medical anthropology and international health planning." Medical Anthropology Newsletter 7(3):12-18. 1976c "Graduate study at Berkeley 1935-1941." In J. P. Loucky and J. R. Jones (eds. ), Paths to the symbolic self.essays in honor of Walter Goldschmidt. Anthropology UCLA 8(1-2):9-18. 1976d "Reply" to Frans J. Schryer, "A reinterpretation of treasure tales and the Image of Limited Good." Current Anthropology 17:710-713. 1976g Review of B. L. Margolies, Princes of the earth: subcultural diversity in a Mexican municipality, and Irwin Press, Tradition and Adaptation: Life in a Modern Yucatan Maya Village. In Hispanic American Historical Review 56(4):678-680. 1976h "Long-term field research in social anthropology," Current Anthropology 17(3):494-496 (with Elizabeth Colson, Thayer Scudder, and Robert V. Kemper). 1977c "Comment on Aceves' review of Brandes' Migration, kinship, and community." American Anthropologist 79(2): 442-443. 1978a Medical anthropology. New York: Wiley & Sons. (co-authored with Barbara Gallatin Anderson). 1978b "Hippocrates' Latin American legacy: 'hot' and 'cold' in contemporary folk medicine." Colloquia in Anthropology 2:3-19. Dallas, Texas: Southern Methodist University, Fort Burgwin Research Center. 1978d "Humoral pathology in Spain and Spanish America." In Homenaie a Julio Caro Baroja pp. 357-370. Madrid: Centro de Investigaciones Sociologicas. 1978h "Foreword" to Richard Critchfield, Shahhat: an Egyptian. Syracuse: Syracuse University Press. pp. ix-xii. 1979a Long-term field research in social anthropology. New York: Academic Press. (co-edited with Thayer Scudder; Elizabeth Colson; and Robert V. Kemper). 1979b "Fieldwork in Tzintzuntzan: the first thirty years." In George M. Foster; Thayer Scudder; Elizabeth Colson; and Robert V. Kemper (eds. ), Long-term field research in social anthropology, pp. 165-184. New York: Academic Press. 1979d "The institute of social anthropology." In Walter Goldschmidt (ed. ), The uses of anthropology, pp. 205-216. Special Publication No. 11. Washington, D.C.: American Anthropological Association. 1979e "Humoral traces in United States folk medicine." Medical Anthropology Newsletter 10(2):17-20. Levy, Jerrold, 1968. "Some Anaxagorean thoughts on atomism, dualism and the effect of the mind on the monad." Human Organization 27(3):230-235. Copyright © 2007 The Regents of the University of California. All rights reserved. Document maintained on server: http://www.lib.berkeley.edu/ by the Anthropology Library.